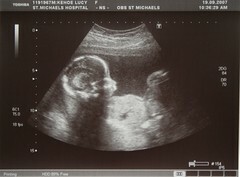 Lucy (well, the baby) is at 21-weeks and doing really well. Here is one of the scans from last week’s ultrasound session. We’ll try to keep the site a bit more up-to-date about the pregnancy and the house-buying (which we’ll tell you about in another post). You look so cool! I’m soooo excited! When can we play?